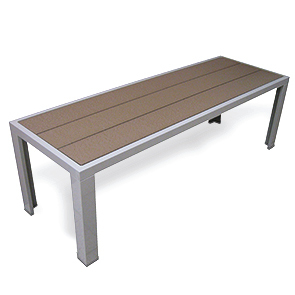 Benches provide easy, convenient seating with great capacity to maximize the user experience indoors and outdoors. The simplicity in design of this 4.75" backless bench features clean lines and blended tones, creating a contemporary and inviting presence. Constructed with environmentally friendly recycled plastic and powder-coated aluminum materials ensures these tables will maintain their original form ready to withstand continued exposure to all-season elements. Create a distinguished, blended setting with matching café tables and side chairs with or without side arms.